Johnson has hosted Bill Belichick, Troy Aikman and other NFL bigwigs on his six-acre compound in Islamorada, on the southern side of the Florida Keys, 125 miles from Cuba. They’ve stayed in his guest house. They’ve fished with him on one of his two boats; Johnson has sailed and fished as far south as the ocean waters shared by Cuba and the United States. Sometimes, he fishes alone. He and wife Rhonda have a fairly idyllic existence. He seldom leaves the Keys, weekly in the fall for his FOX studio show in Los Angeles, and other times if someone pays him to speak. 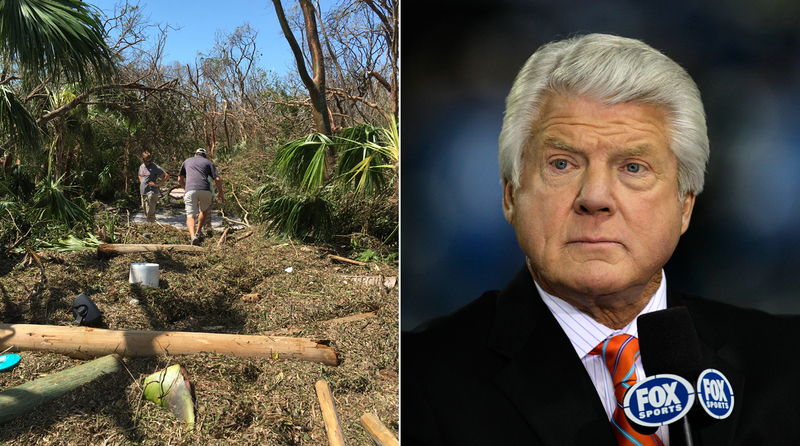 The driveway to Jimmy Johnson’s Florida home was flooded with debris in the aftermath of Hurricane Irma. Tuesday: Johnson sounded beaten down when I spoke to him, still adjusting to the reports and the texted photos of his place. There was two feet of ocean sand in his pool with the Tiki bar on his property. His dock, shredded. His long driveway, covered with what appeared to be seaweed, tree residue and at least one power pole sheared somehow by the roof of his Tiki hut. There’d been 18 inches of water that flowed onto the first floor of his home. Johnson was seeing the effects of the storm through the texted pictures. There’s no question Johnson will stay and rebuild. He said it Sunday, and he repeated it Tuesday. 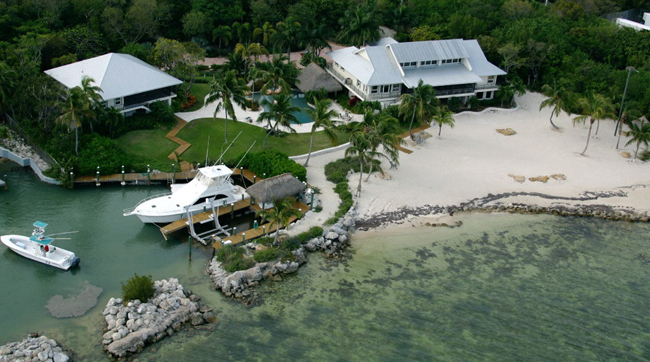 An aerial view of Jimmy Johnson’s property in Islamorada before Hurricane Irma hit the Florida Keys. Johnson is hoping to get back to see his place Wednesday and begin the process of rebuilding. He says you have to have been to the Keys, or know people from there, to understand the devotion to the place, and to understand why the vast majority of residents there won’t leave. Johnson’s a transplant from Texas, but he made it clear in two separate conversations: He’s not leaving, and his place will be back in all its glory. As a lifetime Seahawks fan I find it hard to accept the officiating, although I will admit with our offensive line the Hawks would have still lost. I also recognize that the Hawks have benefitted from some very poor calls over the years (Fail Mary). However to kick out a guy [Seattle cornerback Jeremy Lane] for a phantom punch (without even conferring with the other officials) as well as the borderline at best block-in-the-back call is the poorest performance on one play that I have seen in a long time. My question to you: Are these officials punished for their performance? Thanks for writing from Europe, Brad. Yes, the officials who miss calls in a game (regardless of the magnitude) get sanctioned by a lower grade for the game. Those grades, collectively, determine playoff assignments and, if there are enough downgrades at the end the season, could get an official replaced after the season. The Lane ejection was ridiculous. He never punched him, unless it occurred away from the play when the cameras didn’t catch it. The non-pass-interference call in the end zone on the mugged Jimmy Graham was another miss. There are times when officials want to let the players play, and I get that, and I mostly support that. But that non-call was egregious. Something to ponder regarding the drop in NFL ratings: While I believe it may be 'sexier' (as well as possibly accurate) to link it to labor relations, concussions, etc., I wonder about the impact of folks cutting the cord. We cut our cable (DirecTV to be accurate) earlier this year and by doing so we did away with the NFL package after 18 years. I've decided wasting entire Sundays because I feel obligated based on spending is not how I want to close out my life. I suspect that once some non-traditional content carriers show the NFL, the rating will continue to drop much like other traditional TV shows carried by legacy content providers. I’ve heard the cord-cutting reason. We’re in the process of looking into the ratings decline at The MMQB, and that angle will be investigated. Do you think that part of the reason that there is a ratings issue with the NFL is that they have people like Rex Ryan calling a game and making references to Merlin Olsen? Anyone under 30 wouldn't even know him as an actor or a football player. I think this is the main reason that younger viewers are choosing something else. It's not the game itself; it is the old feel of how it is presented. Very interesting. Memo to whoever’s reading this in the league office: Forward this letter to NFL EVP/Media Brian Rolapp, who is noodling right now about the ratings. Thanks for the shoutout for Oakland's sudden starting kicker, Giorgio Tavecchio. One little piece of info you left out about his game: as I understand it, he is the first kicker in NFL history to hit two 50-yard field goals in a debut. Although he didn't have the best preseason this year, I've been surprised when, after the inevitable camp cut, some other team didn't scoop him up. Milan’s own! Cool thing about Tavecchio’s second 52-yard field goal: It went as close as a kick could go to straight down the middle—and it would have been good from 68. Andy Reid is a longtime believer in the power of pickle juice. Remember the first week of the 2000 season? Eagles at Cowboys and the field temperature was around 120 degrees. The Eagles won 41-14, ushering in a new era in the NFC East. After the game all the talk was about how the Eagles were drinking pickle juice on the sidelines to stay hydrated. The Eagles were the younger team on the verge of something special, so they probably win anyway, but the pickle juice is fondly remembered in Philadelphia for helping our team beat the hated Cowboys. Give an assist to the trainer at the time in Philadelphia and the trainer now in Kansas City, Rick Burkholder. Nothing like that gets done without Burkholder’s approval. He’s one of the best trainers in the league. Re your note about Tom Coughlin having a resting heart rate of 42: The most impressive individual with regard to "Resting Heart Rate" may be Miguel Indurain. His resting pulse rate was as low as 28 BPM, and legend had it that he reached that state within a short time after finishing a stage of the Tour de France. He was asked why he didn't use the handlebars made common by Greg LeMond, and his reply was that it constricted his cardiovascular system. According to Wikipedia, his blood takes 7 litres of oxygen around his body per minute, cardiac output of 50 litres per minute, and lung capacity of 7.8 litres. Way above the average person, substantially better than the average cyclist. You learn all kinds of stuff in the mailbag. Thanks, Ed. A thought about the NFL opening night ratings decline: Do you think the buildup of the Patriots was so much this off-season that no one thought the Chiefs had much of a chance and ignored this game? I was really happy to see so many unpredictable scores this first weekend. It makes the league exciting week-to-week. Could be, Paul. But I’ve been conditioned to think that the first game of the season is always boffo ratings because people have been waiting for football to return—and this year it was even more anticipated because it was Tom Brady’s first game in his forties, and Brady is such a ratings magnet. Guess I was wrong. I do believe the protests before the game are having an impact on the number of viewers watching, but I think eventually true fans will come back. However I believe the poor behavior of the players has an even bigger impact. My take on Ezekiel Elliott? While a six-game ban seems light if he is guilty, at this point a four-game ban would still send a message and put this behind us. I think the lengthy, litigious delays in Bountygate, Deflategate and now the Elliott cases has an even bigger impact in fans losing interest. The lack of trust between the NFLPA and the Commissioner's office has created a poisonous atmosphere that needs to be addressed immediately. Tear up the contract if you must, but bring in a respected judge to dole out the punishment with a review board made of arbitrators that both the owners and union trust. People are sick of these issues dragging out. Couldn’t have written it better myself, Steve. Thank you. Peter, you've been piling on Jared Goff for some time. Saying his arm was below average last year was ludicrous. Ask anyone in the know. Yes he had a lousy year, but since when is 21 for 29 for 306 yards and a touchdown just “competent.” Ask the Niners, Jets, Giants, etc. from last week about quarterback competence. Let's give the kid a little break. Albeit its only one game, he was outstanding. I’m just basing my feelings on Goff based on what I’ve seen, and it hasn’t been much. Having said that, he was highly impressive in Week 1, and he’s clearly been helped by Sean McVay’s tutelage. What really made your column awesome this week was the incredible tale of how Steely Dan influenced your life. On the day Walter Becker died, I listened to their greatest hits CD for the two-hour drive to visit my daughter in Madison, Wisc. When I arrived and was waiting for her, I checked Twitter and saw the news of Walter’s death. I shared the moment with my daughter, who immediately insisted we listen to “Peg” together. She knows all the nuances of the song, and we shared that together, a (late) 50-something, with his 20-year-old daughter. The power of music crosses generations. Thanks for sharing, Dave. I have listened to “My Old School” five times writing this column.